As folks enter their senior years, they may decide to move to an assisted-living community. Others prefer to live independently at home. Some seniors prefer to stay in the house where they raised a family while some may downsize to a smaller home or condo. Regardless of the size of the living space, there are some measures that should be taken to make a home safe for seniors. An often overlooked step to make a home safe for seniors is decluttering the living areas. A person’s ability to move becomes more limited with age. This makes cluttered areas potentially dangerous since it increases the chances of tripping. Clutter also makes it easy to lose important items, so either give away unneeded belongings or take them to a storage facility for safe keeping. Having even, stable flooring is important in making a home safe for senior living. Smooth all bumps and uneven areas on the floor. Consider adding slopes or ramps in place of steps. Remove area rugs or make sure they are securely fastened to the floor. Place anti-slip strips on stairs, kitchen floors, and bathroom floors. A bathroom is a common place for seniors to slip and fall. Install shower and toilet grab bars to help with balance. Some seniors have a hard time standing for long periods, so installing a shower seat is also helpful. Handheld showerheads make it easier to shower while seated. Having a senior’s bedroom, main bathroom, and laundry room on the first floor of the house is best from a safety standpoint. Relocate the bed, laundry machine, and other living essentials to rooms on the lower floor. There will be less need to go upstairs, reducing the risk of injuries in climbing or descending stairs. Digital tools like smart home devices make living at home easier for seniors. Smart home devices control temperature, lighting, door locks, and some appliances from a smartphone. 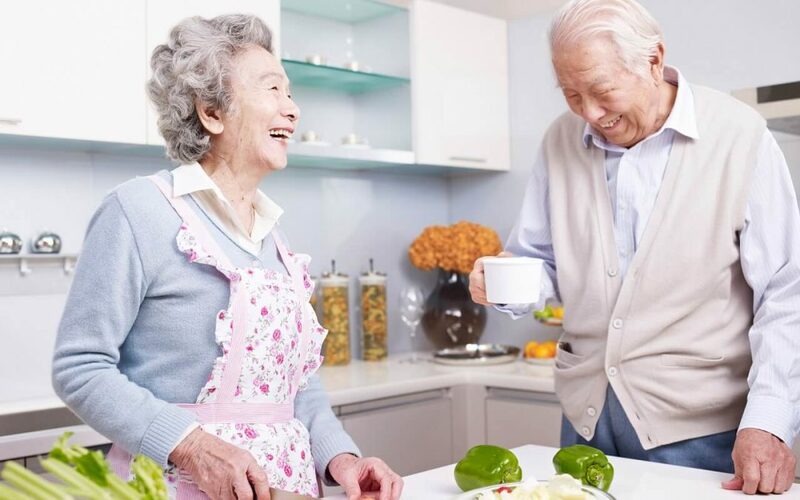 Smart devices help seniors by allowing them to easily monitor and maintain things around the home. People lose flexibility and mobility as they age. Trying to reach too high or too low may cause injury. Remove high cabinets or move items to a lower location for ease of reach. If cabinets are very low, store things there that are rarely used. Keep frequently used items at eye level, whether that’s standing or in a wheelchair. Relocating storage space can be a large project to tackle, but it helps make living at home safe for seniors. When you make a home safe for senior living, you’ll know that your loved one is able to function in their own home. Modify spaces as needed so your elderly loved ones can enjoy an independent lifestyle at home. 360 Inspections provides home inspection services to the Central Valley and Bay Area. Contact us to book an inspection.